Hello, hello! Quite the exciting end to the weekend, huh? I pulled up Twitter on my iPad, as Evan was getting a movie ready (The Social Network). All I said was, "Oh my gosh," followed by a gasp. After turning on the television, it was confirmed that Osama bin Laden had been killed. Scratch The Social Network - we spent the rest of the night watching the news and keeping up on the latest developments via Twitter! I will not turn this blog post into a political rant. But I will say this: I hope all Americans, political affiliation aside, can acknowledge the sheer importance of this development in the War on Terror. I know many may see bin Laden's death in different lights and what it means for America, our troops and terrorism. Regardless, I hope everyone can respect each others' opinions on this matter. 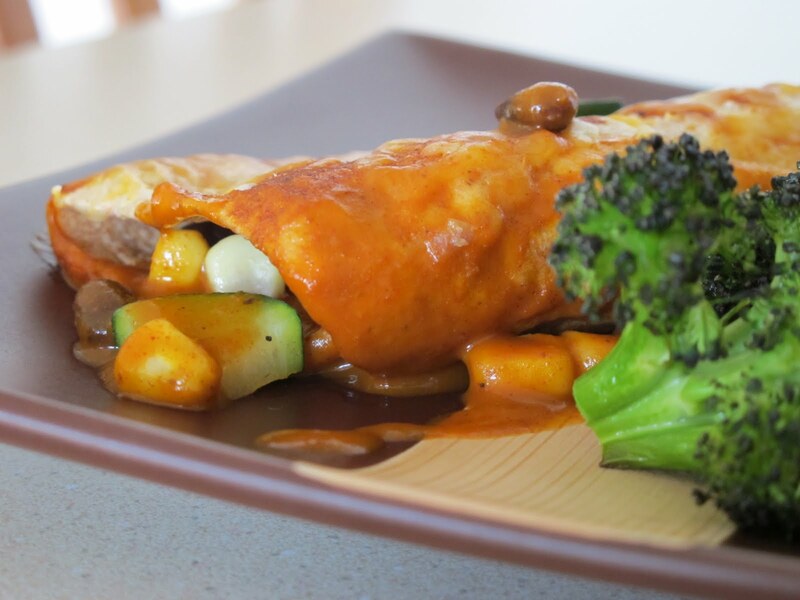 I made veggie & black bean enchiladas last week. 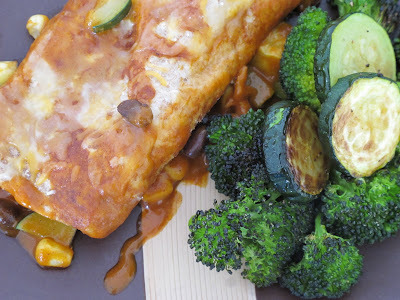 I wanted to use our CSA zucchini in a new way and thought enchiladas would be perfect. Plus, I find Mexican food just so darn comforting. While the original recipe from Cooking Light suggested using homemade enchilada sauce, I opted for pre-made sauce from Trader Joe's. To read more about my thoughts regarding store-bought food items - check out this post. There are great comments on that post also - definitely one of my favorites! Anyway, Evan and I really enjoyed this recipe. It was so easy to make and definitely filling! Besides using store-bought sauce, I also reduced the amount of cheese to 3/4 cup (instead of 2!). Heat oil in a large skillet over medium-high heat. Add 2 cups zucchini and corn; sauté for 5 minutes or until vegetables are tender. Remove from heat, and stir in beans. Spread 1 cup enchilada sauce in the bottom of a 13 x 9-inch baking dish coated with cooking spray. Spoon about 1/2 cup zucchini mixture down center of 1 tortilla and roll up. Place seam-side down in baking dish. Repeat procedure with remaining tortillas and zucchini mixture. Spread remaining 2 cups sauce evenly over enchiladas. Cover with foil; bake at 350° for 30 minutes. Uncover; top with cheese. Bake, uncovered, for 10 minutes or until cheese melts.